Death Note Tokubetsu-hen was published in English as a part of VIZ Media's Death Note All-in-One Edition which was released on September 6, 2017. First of all, I want any readers to keep this in mind while reading my (short) review of this single &quot;oneshot&quot; (pun) chapter. 1) I rated a 10 for story because I thought the story of Death Note as a whole was magnificent, and truly original. 2) I rated character mediocre, because there was no N/A option. This is going to be extremely brief since the chapter is, well, brief. Some fans would go to say that this chapter is completely unnecessary as any addition to the Death Note story. I, however, think it poses a purpose separate from the story itself, and is meant to emphasize just how strong Light and L really were as people. If you've read the chapter in full (I will not spoil it), you know that it is once again shown that the Death Note requires a tremendous amount of willpower and psychological control to keep its user from being overwhelmed by the emotion and guilt that comes from killing people. This is somewhat demonstrated by example, as was said by Light himself at one point. This chapter is meant to show how a normal person handles a Death Note, in contrast to how Light handled his. It emphasizes that Light is an extremely strong person, and even though most fans already know this, this chapter adds some realism to that fact and makes the point stand out. L is obviously also strong, as is shown in various ways by Near's own actions (taking after those of L), and by a flashback to a lecture presented by L to the children of Wammy's house. No regular person could (presumably in the Death Note world) think the way he does or see things his way so easily. This chapter was meant as a supplement to Death Note, its purpose to simply put emphasis on two of the greatest characters in detective/mystery manga. STORY: Outstanding. It's Death Note. ART: Great. Very well done. CHARACTER: N/A. We know all of the characters, and the &quot;character&quot; (attribute) of the story itself doesn't really apply since this is just a oneshot chapter. ENJOYMENT: Good. Not great, because I found it started off a little on the slow side, but I did enjoy the twist at the end (if you can call it a twist, maybe more like an unexpected end). OVERALL: Very Good. It's not on par with the rest of Death Note, but it's worth the read to any fan of the original manga. It's curious in its own way. Story (7): Well, since it's Death Note, I can't really give it that low of a scoring. Because, well, it's Death Note! But the oneshot as a whole (which isn't a lot) wasn't all that great. It was a little upsetting, because it didn't really have anything to do with Death Note, except to just give the Death Note fans 46 more pages of Death Note goodness. But I think that it kind of failed. The best part about the whole thing was the Wammy flashback, when I about had a panic attack when I saw young Matt and Mello off to the side. (I seriously love them that much... XD) So, yeah. This is a long paragraph, so I'm gonna move on now. Art (7): Now the art made me kinda mad, because all of a sudden, it was supposed to be three years, yet Near and Lidner looked really different. Either they were trying to give the look of time passing, or it had just been too long since Death Note had been written that they lost the touch of the Death Note look. Enjoyment (6): I enjoyed it, I guess. Although it could have been a lot better. There were times where I just plain skipped a few pages, because they bored me half to death. Overall (6): This could have been a lot better than it was. It didn't really feel like the Death Note that we love, because there was none of that amazing suspence that Death Note is famous for. There wasn't really a point to this thing, except for maybe trying to make a bit more money off of the Death Note franchise. So, overall, I say just skip it. Read it or don't, 46 pages of random won't really change anything, except you might lose a little bit of respect for Tsugumi Ohba like I did. Death Note was a fantastic manga and anime series--sometimes, in the entertainment industry, really successful works get the creators thinking: &quot;So many people liked this. What can we do to keep making profit off the fans?&quot; This usually spawns a sequel, but a general rule of movies/books/etc. is that sequels for profit just don't work. 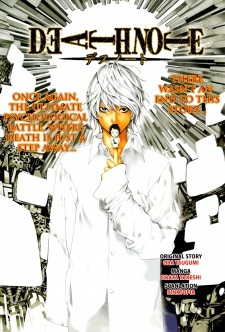 Death Note is one of the latest victims of this, with a one-shot &quot;follow-up&quot; that leaves the readers wondering what was the point. Story: This is Death Note, after all. The story, limited as it was, involves another Death Note killer. Three years after the ending of the original series, people begin dying mysteriously once again. However, this murderer's victims are very different from the original Kira's. The story revolves around that to an extent, but there isn't half as much drive or suspense as in the original. I suppose that is to be expected from a one-shot, but the way it was presented was quite uninteresting. The only thing worth reading was a short flashback of L speaking with the Wammy's House orphans, which gives a little more well-deserved insight into L's character. Beyond that interesting little tidbit, the story played out like a really bad fanfiction that happened to be written by a professional. The professional, actually: Ohba's still the writer here. This is surprising because you would expect it to be so much better, being written by the original author. The whole concept of another Death Note user just seems to ruin the whole idea for me: the series' ending was wonderful as it was. I, for one, was perfectly content with how it ended, and to be honest, the original idea of Death Note can only be used once: after that, it's being recycled and is not as good. Art: The art was way off this time; the characters we know and love all look different, and not just because it takes place three years later. For instance, the adults. The way they were drawn, they just looked...different. I can't think of a better way to describe it. It seemed like the artist decided to slop his way through it, or maybe forgot how to draw the characters since it's been a little while. But that's unlikely. Character: Terrible. Ohba wasn't thinking straight, because most of the characters are unforgivably &quot;OOC.&quot; There are one or two new characters, but the others have weirdly different personalities all of a sudden. I'm not condemning the characters because of their lack of development--since this is a one-shot story, that's to be expected--but for how out-of-character everyone was. Enjoyment: I'll name the two enjoyable things: the orphanage flashback, and the fact that Near is now building a Card House Empire that fills up an entire large room. Even better than the original Dice City that I liked so much. Overall: Since the whole purpose of this one-shot was to make the creators money, and they didn't seem all that interested in keeping to the original series' pace and tone, and felt like majorly messing with the story's canon, there is very little merit to reading this. Unless you want to demonstrate how very, very bad sequels can get, skip it. You'll be no less of a Death Note fan for doing so. I think it was good but they should have made it a little longer. Some Originals, so it was great to see what happened to them after the original. I reallly liked reading this because my favourite character is Near and ever since i finished the original, ive wanted more.